Vina Fay Wray was born on 15 September 1907 in Alberta, Canada. Her family moved to Arizona when she was 3, and then to Salt Lake City when she was 5. Visits to the Kinema and participation in school plays whetted her appetite for performing. Surviving childhood hardships such as the influenza epidemic of 1918 (during which she lost a sister), Fay left for Los Angeles. Before she was 19 she appeared in a number of films, mainly westerns, under contract with Universal for $75 a week. She was nominated to be WAMPAS (Western Association of Motion Picture Advertisers) Baby Star of 1926 along with other young actresses like Mary Astor, Joan Crawford, Dolores Costello, Marceline Day, Dolores Del Rio, and Janet Gaynor. Despite her contract, she jumped at the chance to meet Erich Von Stroheim in hopes of being cast in his film The Wedding March as Mitzi. Luck was on her side as Universal agreed to cancel her contract, and Von Stroheim cast her when she was still 19. Fay married screenwriter John Saunders on June 15, 1928 when she was 20. Her second husband was screenwriter Robert Riskin in 1942. Fay Wray passed away on Sunday night, August 8 2004, in her apartment in Manhattan, at age 96. Published by St. Martin's press, 175 Fifth Avenue, New York, NY 10010. On the other hand : a life story / Fay Wray. The final paragraph reads: No one who made movies during the thirties thought of those years as the Golden Age. Imagine anyone saying, "Here I am in the Golden Age!" It seems we don't know much about defining anything until long after the fact. I feel very good that there was a Golden Age and that I was a little, even a very little, part of it. 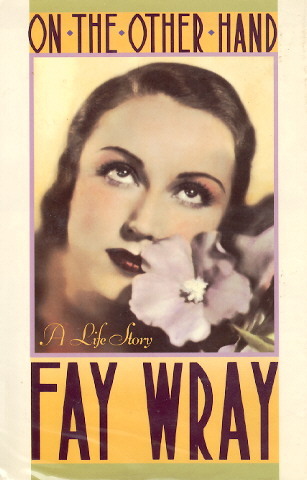 A mostly autobiographical play written by Fay Wray. An impoverished family living in a coppermill town; a mother careful to protect her children and relationships. The play was performed twice in New Hampshire and Pennsylvania.